Founded around the VII and Vi century BC with the name Auximum to mean a widening of the previous and more important Greek colony of Ancona. For centuries, because of its strategic position on the top of a hill between the valleys of the Musone and the Aspio, Osimo was theatre of fightings between Picen populations and Senonian Galliums who had in Senigallia theirs understood them. It became Roman municipium in 270 a.C. and was fortified with high walls knowing a period of maximum splendor becoming the city most important of the region. After the end of Western Roman Empire it was subject to the ivasions of the Goths and was the center of the fightings between Ostrogoths and Byzantines, enduring for 7 months the besiege of famous general Belisario (539 AD). 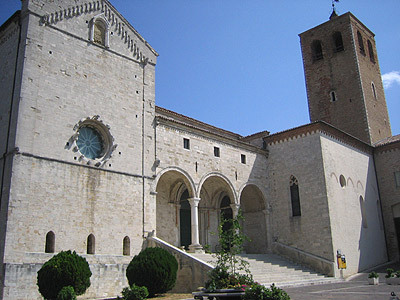 With the advent of the Franks of Carl the Great and the consequent end of the Longobard Reign, Osimo became part of the Papal State but subsequently it was proclamated the Comune (Municipality - 1190) and later Osimo partecipated the the Ghibelline movement on the side of Federico Barbarossa and Federico II against the Church of Rome. After the end of the Svevian Empire and the restoration of the papal power, Osimo knew the lordship of the Malatesta and Sforza. In the half of '400 Osimo and Ancona clashed in the famous “Battle of Pig” (1477). From the town-walls and after a stop at Fonte Magna (Source - I sec. BC), you can enter into Osimo through Porta San Giacomo (Door), and going up there's the main monument of Osimo: the Chatedral of S. Leopardo, erected in the VIII century where it rose the Campidoglio and the temple of Esculapio and Igea then rebuilt (XII cent.) in Romanesque style. Many are the monuments and the artistic pearls of this medieval center. Among these we like to remember the Baptistry (1200) near which it rises the Dyocesan Museum of sacred art and the Sanctuary of S. Giuseppe from Copertino (1247-1308).